Organizers for a two-ship mini-flotilla headed towards Gaza say activists have vowed not to resist IDF commandos sent to intercept them. 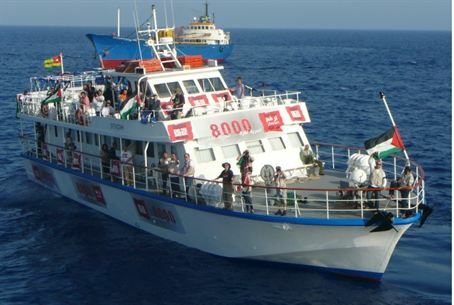 Activists aboard two vessels seeking to violate Israel's blockade of Hamas in Gaza say they won't resist Israeli naval forces when boarded. "The two ships are close to Israel's waters and their crew has been instructed not to resist naval forces who will attempt to stop them," Denis Kosseim told AFP. "Our representatives have signed a document where they pledged not to resist in case Israeli forces board the ship. We hope they will be able to return unharmed." A failed flotilla of 17 planned vessels that ended with a single French vessel striking out towards Gaza in July ended without incident when Israeli naval commandoes boarded the vessel and redirected it to the port of Ashdod. The latest flotilla consists of one Canadian ship called Tahrir and an Irish yacht. On board the vessels are 27 activists, crewmen and journalists, including one Iranian reporter. Organizers say the ships carry $30,000 worth of medical equipment for the people of Gaza. However, Israeli defense officials say if the purpose of the flotilla were aid rather than a media spectacle and provocation the supplies carried could easily be unloaded in Ashdod and shipped by ground to Gaza. The Kerem Shalom crossing connecting Israel to Gaza has remained open despite rocket fire and is never at full capacity despite all aid requests from Gaza being met. The amount of aid carried by the ships, they say, is negligible in light of the hundreds trucks per day that enter Gaza from Israel. During Ramadan imams in Gaza sought to collect surplus aid from local residents to repackage and send to Somalia. Earlier this year the UN Palmer commission concluded Israel’s blockade of Gaza was a “legal and appropriate” method of preventing the flow of arms to the Hamas terror organization.